These gorgeous postcards are perfect for coloring in before sending them off to family and friendsThis lovely, small-format book contains 25 beautifully intricate illustrated postcards to color in, each with a floral theme or pattern. Each postcard is easily detached and has space on the back for a message and address, so they can be easily removed, colored, and sent as a stunning and sophisticated gift. 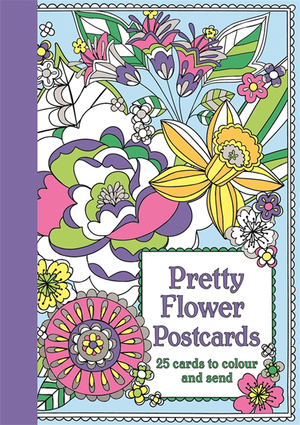 With an eye-catching foil cover and detailed black-and-white designs to color in, The Pretty Flower Postcards Coloring Book would make a gorgeous gift for the artistically inclined. Beth Gunnell is a freelance designer and artist who has illustrated beautiful patterns for coloring books including The Animal Colouring Book, The Beautiful Patterns Colouring Book, and Pretty Patterns Colouring Book.